If you are looking for non traditional wedding gowns... you are in the right place! You no doubt, are a person who likes to do things a little differently then expected. So why wouldn't you be the same way when it comes to your wedding! And one of the best ways to express your uniqueness is through your wedding dress. Which brides would non-traditional bridal dresses appeal to? Those having an informal wedding. If you want "two looks in one"
When looking for non-traditional wedding dresses, what should you consider? Look at evening wear including prom dresses. You would be surprised at what you may find among this group. 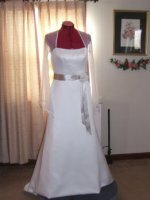 Some designers of mother of the bride gowns have some very stylish designs especially for a mature bride. A bridal suit could be just the right thing, perfect for a court house or civil wedding ceremony. Also bridesmaids dresses can be used as alternative wedding dresses since some designers make them in white or ivory. Bridesmaid dresses can be used as bridal dresses. They come in a variety of styles and some manufacturers make them in white and ivory. is that you can wear it again for another formal occasion, if you wish. It's not like a traditional wedding dress that you only wear for weddings. This way you will get more value for your dollar!